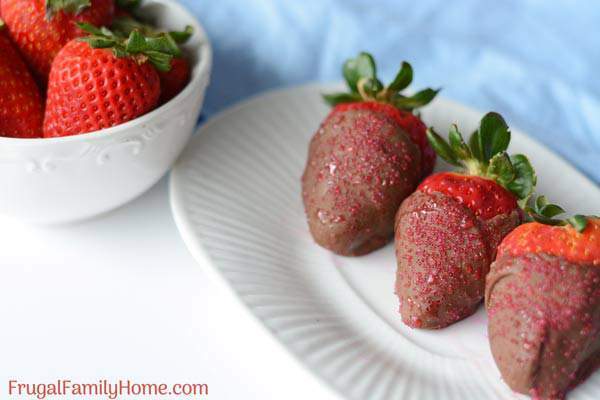 Valentine’s day is coming and one great dessert for your honey are these easy chocolate covered strawberries. 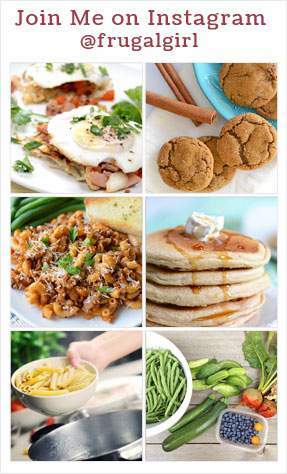 While you can purchase them at the grocery store, you can save money and make them more special by making them yourself. I’ve seen these yummy chocolate covered strawberries at the store. They look so yummy and good. But the price of 4 of them turns me off and I move along. 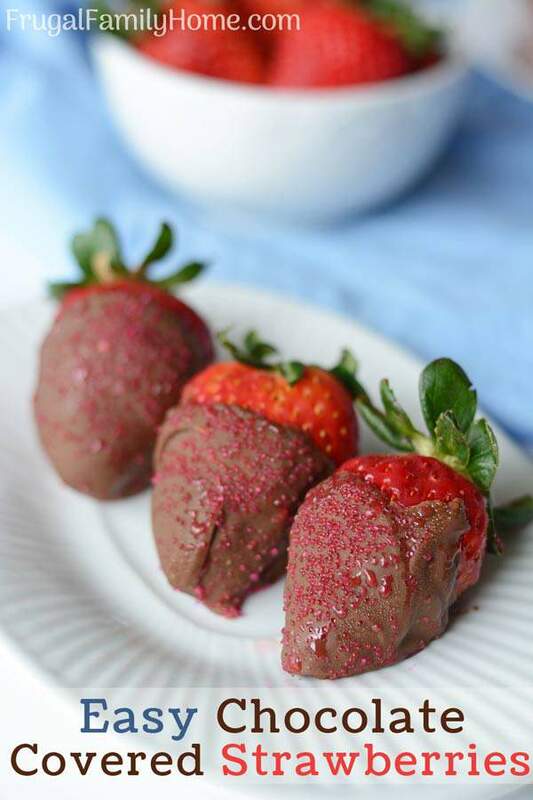 With three simple ingredients, you can make your own chocolate covered strawberries at home. They are super simple to make. I’ve made a video to show how easy it is to make your own homemade chocolate covered strawberries below. But if watching a video isn’t your think, keep on scrolling for tips and the printable recipe below. 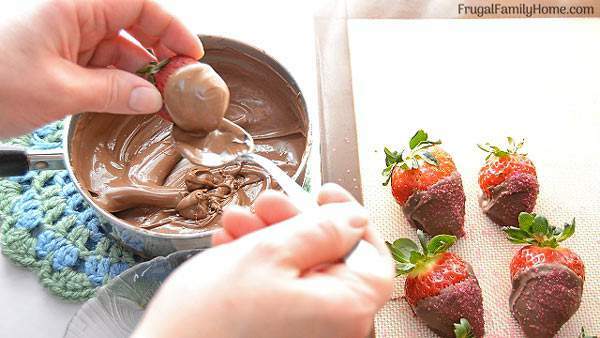 A few tips to help your chocolate covered strawberries turn out great. Melt the chocolate coating on low. It takes a little longer but there is less chance of overheating it and making it grainy. Keep the green leaf tops on the strawberries. Having the green leaves to hold onto while adding the chocolate to the strawberries make it so much easier. Without the green leaves on top the strawberries can be slick to hold onto. Wash the strawberries and then dry them well. I washed our strawberries and then took a dish towel to get all the water off of them. I let them sit and air dry too while I was melting the chocolate. 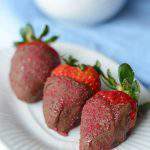 If you don’t dry the strawberries, the water can make it hard to get the chocolate to adhere to the strawberries. Prepare your work surface before you start. I set out one of my silicone sheet plan liners to set the dipped strawberries on. The silicone sheet makes it easy to peel them off when they are set up. Be ready with the sprinkles. You’ll want to dip the strawberries, let them drip off and then place on the lined sheet pan. Then sprinkle the sprinkles on the strawberries. If you wait too long and the surface of the chocolate will harden up and the sprinkles will not stick. Be sure to dip and sprinkle as you go along. If you wait until they are all dipped sprinkles won’t stick. 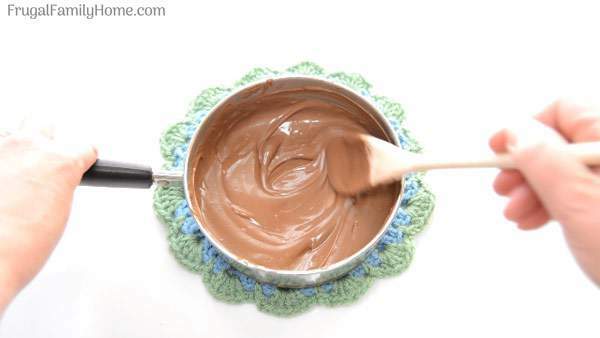 Add the chocolate to a small saucepan. Heat over low heat until the bark is melted. Keep stirring so the chocolate doesn’t overheat. Once the chocolate is melted and smooth, dip the strawberries in the chocolate or drizzle the chocolate over the strawberries to coat 3/4 of the berry. Place the berry on a silicone lined sheet pan and sprinkle with the sprinkles if desired. Repeat for the rest of the strawberries. 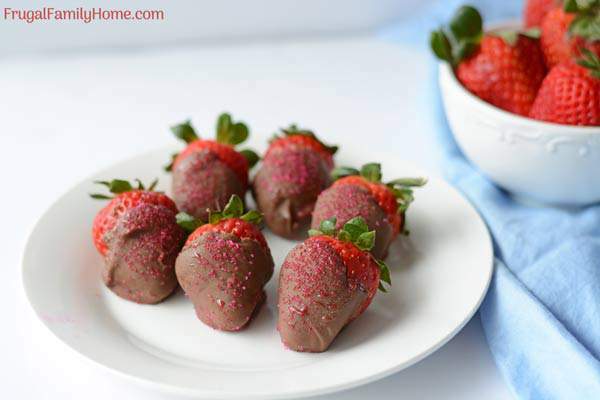 Let the strawberries sit at room temperature until the chocolate is set, then refrigerate. It’s best to make the chocolate covered strawberry close to the time you’ll be serving them. After you dip the strawberries, let them harden at room temperature. Once harden they can be stored in a covered container in the refrigerator for about 24 hours. When storing the strawberries I made, I found they kept well for the first 24 hours. Then after that, I had to put a paper towel in the bottom of the container to keep the moisture down. They kept well until about 48 hours after that the quality of the strawberries went down quickly. Be sure to prepare your strawberries close to enjoying them for the best quality. How Much Does it Cost to Make a Batch of Chocolate Covered Strawberries? The prices I paid for the ingredients to make the chocolate covered strawberries are below. I found the ingredients at regular prices at our local stores. The cost of your chocolate covered strawberries may be more or less depending on your local prices. The recipe uses about a half pound of strawberries with 1 cup of chocolate drops. And about 1/4 of the container of sprinkles. That made about 10 medium sized chocolate covered strawberries. The full recipe came to $2.17. Which makes each strawberry about $.22. About half to one third the price of the store-bought ones. That’s all there is to making chocolate covered strawberries. 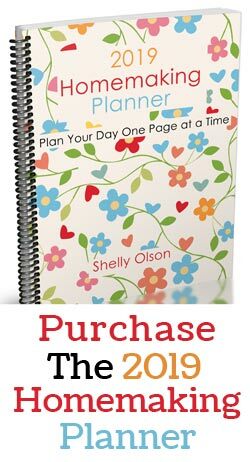 It’s an easy process to do and can save you half the price or more over ready-made chocolate covered strawberries at the store. This Valentine’s day make your dessert more special by making it in your own kitchen. 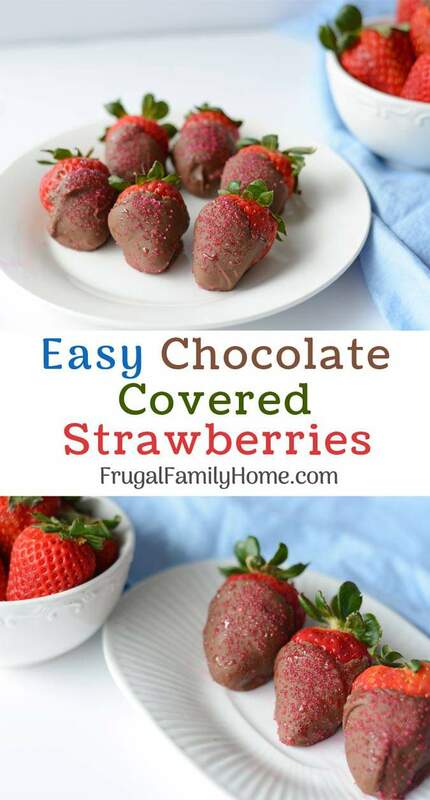 Give these simple and easy chocolate covered strawberries a try. Those look so good, Shelly! My son just asked if we can make them today. LOL 🙂 I’ll have to pin this post for later! I have chocolate chips in my cabinet. Will those work? Yes, you can use chocolate chips and melt them instead of using chocolate bark. I’ve used them in a pinch in the past. If you have shortening or coconut oil, you might add a little of one of them so the chocolate, when set up, isn’t quite so hard. I’d add about a teaspoon.